Third time's the charm: unlike the previous two years, we managed to arrive in New Orleans on the day we'd planned to arrive. But the trip was unpleasant enough that we wondered if we'd made the right choice. We were offered the chance to get bumped, but we declined, because we have had trouble using airline travel vouchers in the past and we wanted to get to New Orleans on time for once. The flight to Chicago was unremarkable. We tried to get dinner at Frontera Tortas. Unfortunately, I overestimated how long we had before we boarded our next flight, and we had to carry our food onto the plane. We did not enjoy the tortas at all, and we found the tortilla chips much too salty - but that may have been affected by the fact that we were eating the tortas after they'd been cooling for forty minutes, in the dreadful ambience of a cramped plane seat where the person in front of me had leaned back so far that I could have used his hair as a napkin. 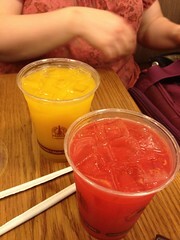 However, the agua frescas that we had before boarding were wonderful; Lori had the mango lime flavor, and I had the cactus pear. Mine was really quite tart, which I really enjoy. The flight from Chicago to New Orleans was very bumpy and turbulent because of thunderstorms passing through Louisiana. I'm not normally prone to airsickness, but I was feeling quite uncomfortable. The woman at the car rental agency made me feel that we had plunged deeply into Southern hospitality; her familiarities went from "honey" up to "sweetheart". She offered us a complimentary upgrade to a minivan. I considered the challenges of driving through the narrow streets of the French Quarter and declined the offer—which threw her off track. Finally comprehension dawned: "you're offering me a minivan because you have no mid-sized cars in stock." Once I understood that, I accepted the minivan cheerfully. We found the bed and breakfast without difficulty, and I managed to parallel park the minivan, even though I had not routinely driven a car that large in a decade. The proprietor had stayed up late for us.